Why to Book Farmhouses or Villas For New Year Party? The biggest dilemma any party lover faces is when he/she is asked to choose between partying at a farmhouse/villa and some swanky looking lounge. Isn’t that right? What about you? What would you choose between the two? Honestly, we feel the real fun of celebrating New Year would be at a farmhouse in Delhi NCR. You can throw a pool party, or some theme party to spice-up your New Year party this year. Not only that, you can choose your food, invent your own mix of cocktails, and play games to make your party interesting. Now you can’t do all these things in some club or lounge, can you? That’s the beauty of partying at villas; your party, your people, and not a single stranger to ruin your party mood. Pretty amazing way to welcome New Year, isn’t it? Club, bar or lounge parties are fun, and most of you must be planning to celebrate your New Year party at one of these nightlife restaurants in Delhi. But, aren’t you tired of partying the same way over and over? Instead, why don’t you book a villa for your New Year party in the same budget as your club party (maybe less) and have a blast at top farmhouse party venues in Delhi NCR? We’ll help you out in booking one of the best villas for new year party in Delhi NCR at the best-discounted price (Pinky swear). Would you like to know how you can book a farmhouse or villas for your New Year Party in Delhi NCR at affordable prices? Check out our simpler than simple process down here. 1. Browse: You can start by browsing through our Farmhouse or villa party venues in Delhi NCR on the website. There you’ll find plenty of gorgeous looking farmhouses, villas, houses. Some of them are with swimming pools too, just in case if you’d like to host a pool party to celebrate your New Year party this year. 2. Share: Couldn’t find a suitable villa for your New Year party? No worries, you can share your New Year party requirements with our venue experts. 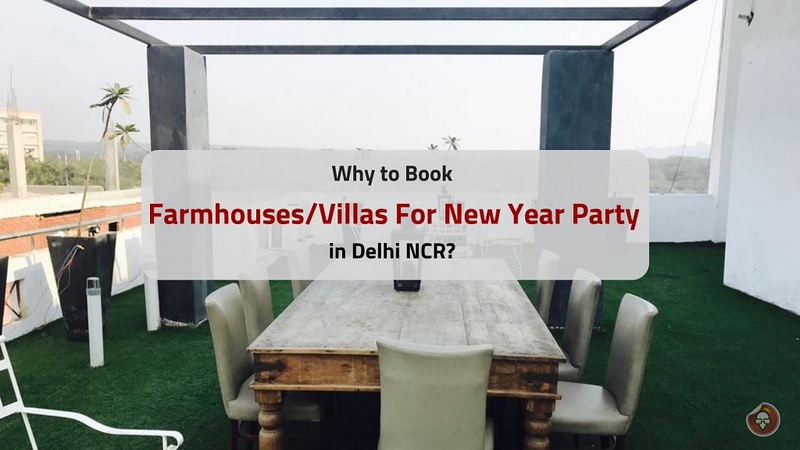 They will mail you a curated list of all the farmhouses or villas for New Year parties in Delhi NCR starting from as basic price as Rs 5000 per night. 3. Select: Go through our curated list of New Year party farmhouse party venues and ‘click on the final price’ in front of whichever house, farmhouse, or villa you’d like to book. After clicking on that link, you’ll be able to see the direct contact information of the property owner or caretaker. You’ll receive a call from the property owner or caretaker of your selected house party venues. You can talk to him, and finalise your party venue afterwards. 4. Book: Well, congratulations if you have reached to this step. That simply means you liked one of our villa or farmhouse for your New Year party, and now you want to book it. Great! So to book your New Year party venue through us all you have to do is, pay 15% of party package amount in advance and that property would be rented under your name. Now comes our top 13 farmhouses, villas, or houses which you can rent to host a kickass New Year party this year. Tariff: Rs. 5000 – 6,000 per night approx. Tariff: Rs. 7,000 per night approx. Amenities: 3 AC rooms, 3 Attached washrooms, 3 Beds, 3 Attached Balconies, 3 TVs, 1 Big Common Area, All night music allowed, Smoking allowed, Crockery available, Extra room available at additional cost. Tariff: Rs. 6,500 per night approx. Amenities: 4 AC rooms, 4 Attached washrooms, 4 Beds, 4 TVs, 1 Big Common Area, Crockery available, extra room available at additional cost. Amenities: 4 AC rooms, 4 beds, 2 Attached Washrooms, 2 Washrooms in Common Area, 1 Common area, In-House Fountain, All night music allowed, Drinking allowed, Smoking allowed, Crockery available. Tariff: Rs. 8,000 per night approx. Tariff: Rs. 10,000 per night approx. Tariff: Rs.10,000 per night approx. Amenities: 3 AC rooms, 3 Attached washrooms, 3 Beds, 3 Attached Balconies, 3 TVs, 1 terrace Garden for parties, All night music allowed, Smoking allowed, Drinking allowed, Crockery available, extra room available at additional cost. Tariff: Rs. 11,000 per night approx. Tariff: Rs. 13,000 per night approx. Tariff: Rs. 18,000 per night approx. That was all from our side folks. Our apologies if we took too much of your time. We just always wish for you to have good party time with your friends. You can book any of these farmhouses, villas, apartments, villas for new year party and have a blast with your friends. If you still have any confusion, you can always get in touch with our venue experts. This entry was posted in Farmhouse Party, New Year Party and tagged farmhouses for new year party, farmhouses for party, farmhouses in gurgaon, new year party venues. Bookmark the permalink.